In ancient Greek, the word "hypocrite" meant a stage actor. This is a good word for people who are one way but present another. The Pharisees were a great example, and Jesus gave them seven "woes" we can take to heart today. Watch this short vlog then listen to the podcast of the same name. 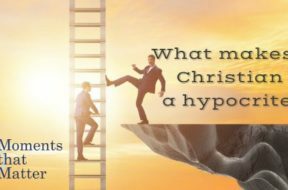 What Makes a Christian a Hypocrite? Throughout history, Christian hypocrisy abounds. 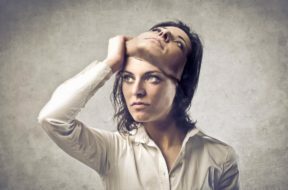 What provokes someone to be two-faced and therefore unreliable? If we have already fallen into the hypocrisy trap, what does it take to get up, get out and get going? 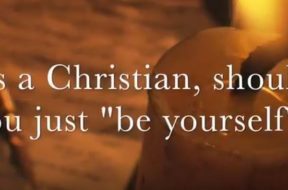 “Just be yourself, no can ask any more of you than that.” This is such free and easy advice – someone has probably said it to you, and you have probably said it to someone else. But what does it mean? The fact is we sometimes end up defined by our circumstances or perceptions. In these cases we settle for outside forces labeling our inside person. Other times we are defined by our vision and discipline in the face of challenge. Find out how our brains define us and also how the Scriptures define us. Watch this quick vlog then listen to the entire podcast of the same name. Jesus loves you! This is a true, simple and potentially life-changing statement. Once we accept what that three-word sentence actually means, it can become a steering mechanism for everyday of our lives, pointing us to righteousness, godliness and self-sacrifice. Jesus loves you. Pointed and refreshing, but what does it really mean? Does Jesus’ love for us guide us in our everyday experiences? Yes! Does his love for us mean that he wants the best for us? Of course! Okay, so if he wants the best for us does that refer to comfort and abundance in our lives? Does Jesus’ love for us bring us to better living conditions, more financial stability, a much better present and a brighter future? The answers to these questions will vary wildly depending on whose brand of Christianity you look at and this just confuses the matter. 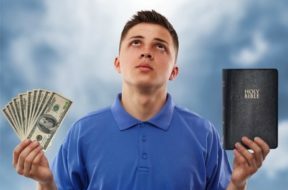 Instead of asking different Christians about the role of comfort and abundance in a Christian’s life, let’s find the answer from Jesus’ own teachings and the Apostle’s own words.